Aluminum composite panels have been making headlines of late for all the wrong reasons. The subject of scourge was at the heart—or rather, outer edges—of the Grenfell Tower disaster in the U.K. that saw a fire take the lives of an estimated 80 people as flames traveled via the building's aluminum composite cladding. However, at Facades+ AM conference in Austin yesterday morning, the material was shown in a new light. 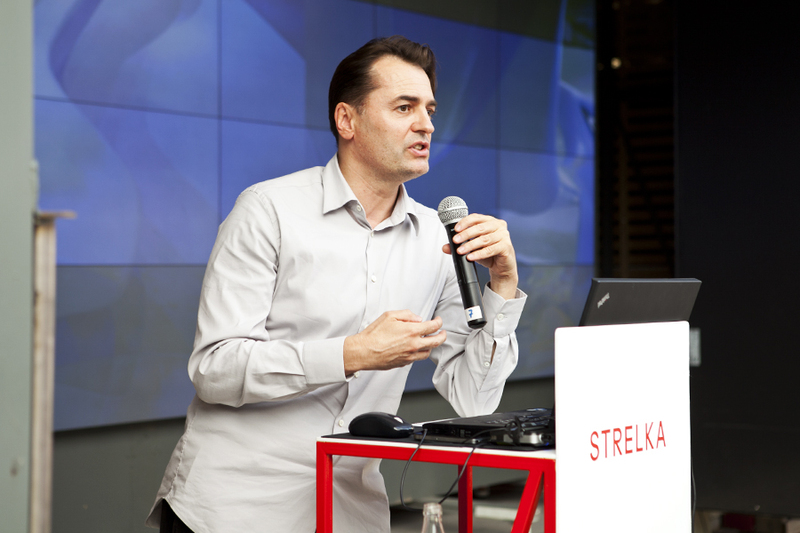 As part of the opening discussion panel, titled Digital Design and Fabrication Frontiers, principal at OTA+, Kory Bieg demonstrated how aluminum composite panels can be used to make three-dimensional structures such as arches and vaults. 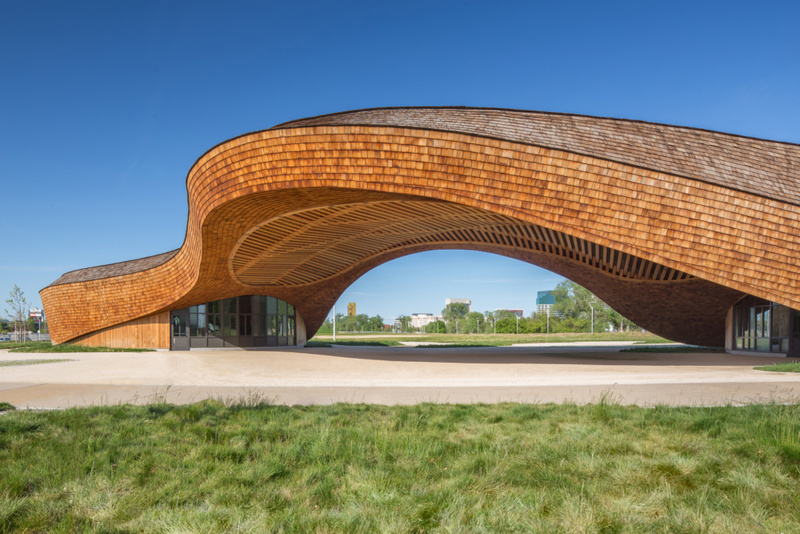 Speaking to The Architect's Newspaper (AN), Bieg described how he used parametric design tools such as the Kangaroo plugin for Grasshopper to design Caret 6. 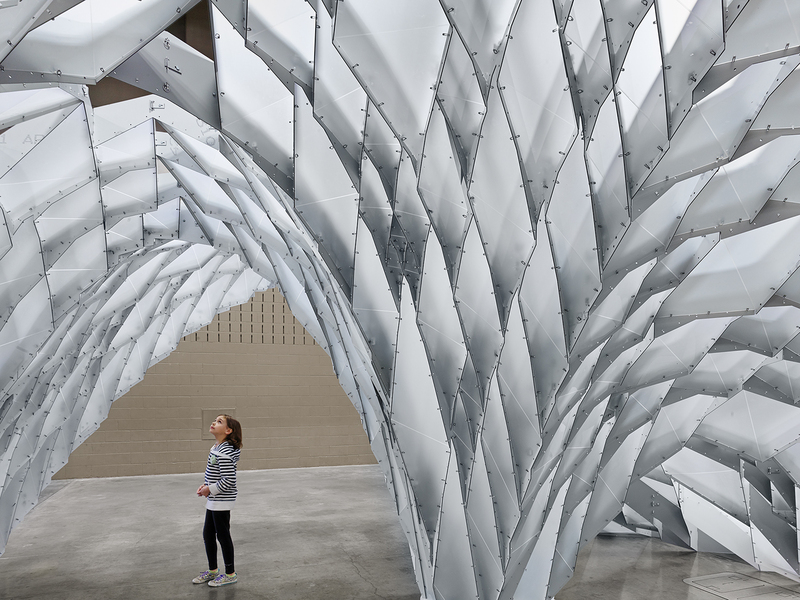 The vaulting structure, designed and fabricated by his Design V Studio at the University of Texas at Austin School of Architecture, was part of an exhibition on metal structures in 2013. 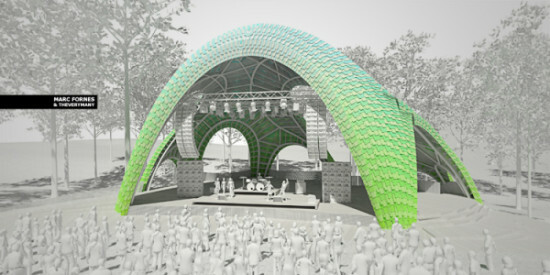 Caret 6 is comprised of large folded panels and responds to a brief that called for a structure using aggregation, weaving, and stacking techniques to create an assembly that could transition from a flat surface to a volumetric enclosure. "To enable a smooth transition from a flat, two-dimensional ground surface into a volumetric, three-dimensional vault, the studio used a diamond pattern that could work as both an aggregate and woven rib-system. Though the diamond pattern appears to be series of stacked cells, the structure is actually three layers of overlapping ribs," said OTA+ on its website. "Large, continuous primary ribs form the seams from vault to vault, while secondary ribs span between each seam. Tertiary ribs complete the web and enclose each cell to create a rigid structure." "A core goal of the studio was to introduce asymmetry into what would otherwise be a symmetrical form. The vault is roughly eleven foot at its highest point, enclosing a space small enough for occupants to engage directly with the surface, a condition atypical for most vaults which often frame larger and much taller spaces. "Caret 6 was designed to fill an already existing space," said Bieg, "so it was necessary to design a geometry that responded to the existing room, especially at the edges, where the vaulting forms project toward the walls." Bieg benefitted from using Robot Structural Analysis which enabled him to model and test different Aluminum Composite Panel configurations to find the optimum structural solution. "Ultimately, we added a layer of attachment details that included thousands of O-rings and binder rings to ensure stability in the event a lateral force or unexpected point load is applied (ie. someone hanging on the edge of the cantilever), but in its resting state, Caret 6 does not require any fasteners," the firm said. Bieg was joined by Anthony Birchler of fabrication firm Zahner. "Digital manufacturing plays an enormous role in not only what we do, but the changing landscape of architecture and design fields," he said speaking to AN. "Designers want to understand how they can interface with a firm like Zahner—and here's the big part—they need to know how to establish this kind of precedent with their clients in our industry. 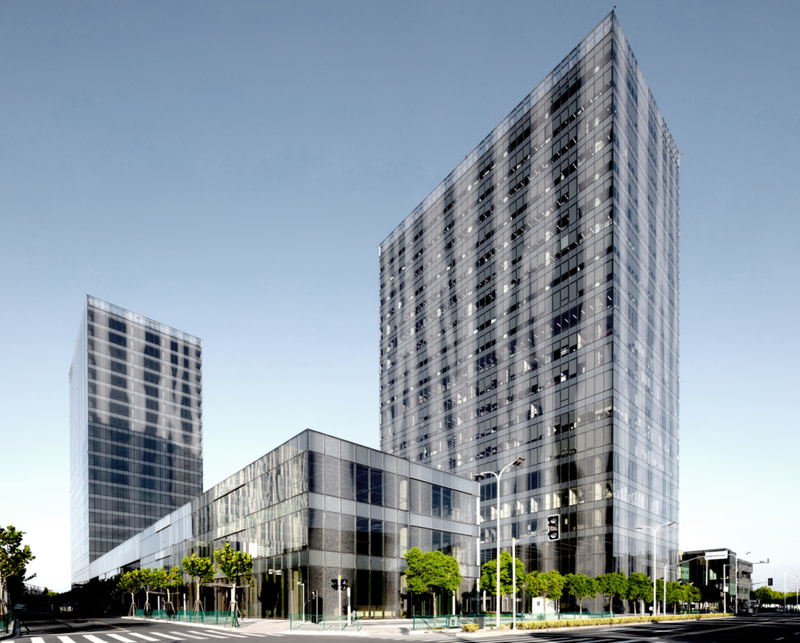 Our presentation shows how firms are accomplishing unique architectural works. This isn't theoretical. 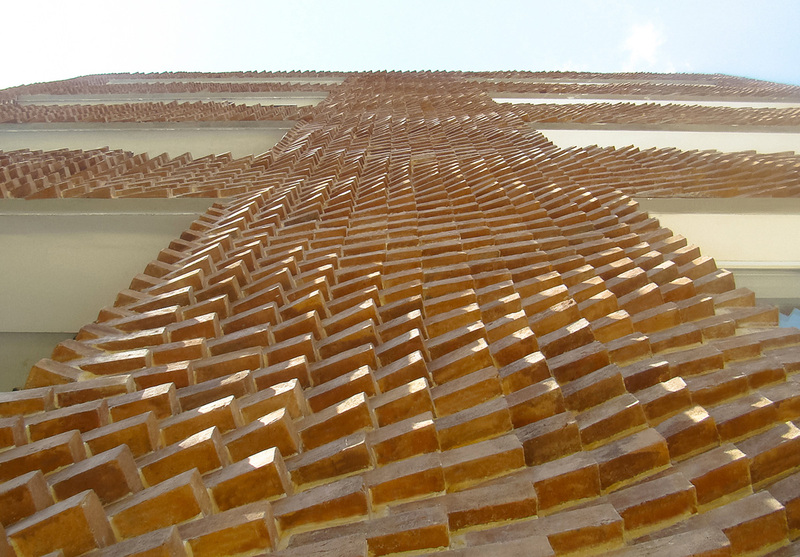 This is our practice, and we want to show you how you can do this kind of work"
Another challenge for the project team was the dimensional stability of the brick units. For this facade, three different colors and dimensions (from 7.5 inches to 8 inches) are incorporated due to a handmade manufacturing process that yields variation based on heat exposure from location in the kiln. Naghavi says the brick laying method was able to accommodate this diversity by prioritizing a clean starting and ending point at the corners of the facade. “You need to align the outer corner of the brick with inside of the stencil, and that’s all that matters. 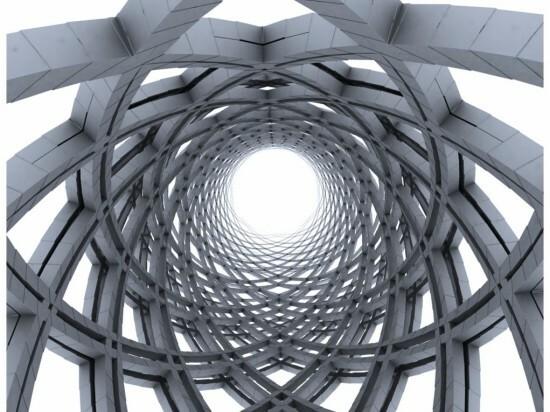 This will result in a change in the width of the vertical bonds which does not matter because they already are a mess.” Negative Precision challenges a “surplus precision” of digital fabrication, which typically drives up project cost. “A considerable part of building industry functions with lower precision, and uses production methods of the last century. In other words, digital technology is a luxury, though it may not be revealed in the first glance,” said Naghavi in an interview with AN. “Precision fetishism is generally interesting as it is a phenomenon everybody is struggling with in some level, whether in buildings or raising a kid. Apparently as a group of mammals we like organizing, and we are very capable of liking it too much.” By allowing for some degree of error in the translation between his digital model and the built form, Naghavi has prioritized economy over precision, embracing a "lo-fi" approach to digital fabrication: “I avoided an accurate 3-D model, not only for my own laziness, but also for generalizing the design method and unbinding it from the 3-D model. The builder is left on site with a new tool.” Naghavi said his work actually consists of three parallel projects: a building, a method, and a paper. 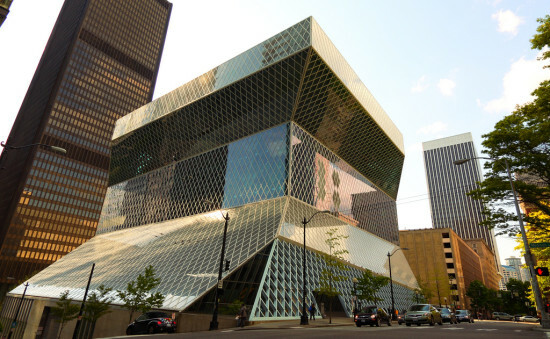 “I think the more we move away from the matter [the built work] toward words, the result becomes more important as it will have a longer life.” Naghavi says the paper has taken more time than the building. “This brick project is a very small outcome of the strategies discussed in the paper.” To continue the discussion, another significant artifact of the project—the 17 lasercut aluminum stencils—are up for sale on sstudiomm's website, which offers a DIY kit geared towards design professionals. Each year, the Burning Man festival held in the Black Rock desert of Nevada attracts fantastical sculptures of all shapes and sizes. Joshua Potter, a fifth year student at the University of Westminster in London, is hoping that his structure "PURSUIT" will make to this years festival. Part of his studio assignment, PURSUIT follows a parametric approach—and an emphasis on self-reliance to fund student projects—that has become synonymous with his studio unit. Run by tutors Arthur Mamou-Mani and Toby Burgess, the studio, named DS10, has garnered a strong pedigree for complex designs. 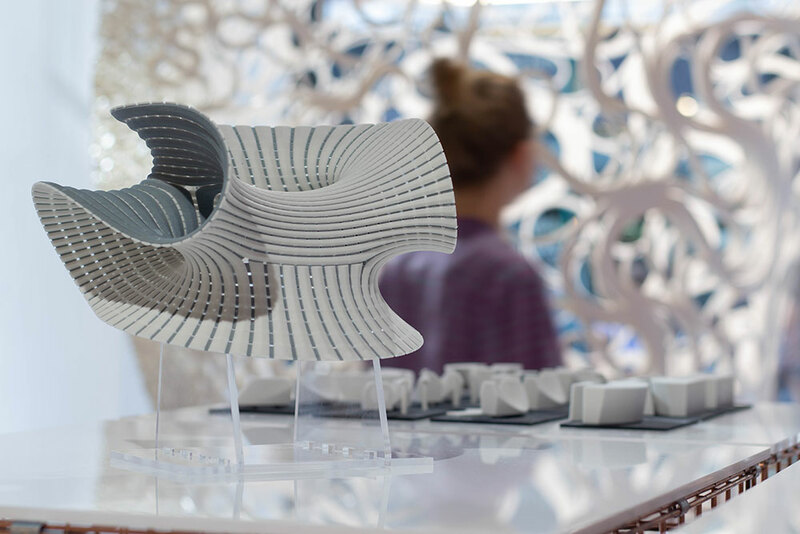 However, DS10's primary approach, according to Potter is about producing "happy and fun" architecture that also relies on rigorous testing such as model making and digital fabrication. “The studio's philosophy is to involve students as much as possible in the design, fabrication and construction process" the two said. "We chose Burning Man for its ten guiding principles which include ‘Radical Self-Reliance,’ ‘Radical Self-Expression,’ ‘Leave no trace,’ and ‘communal effort.’ This meant playful and climbable structures, fully built by us as a team in a way that wouldn't harm the local environment.” Within the past five years, DS10 has submitted over 80 projects to the Global Arts Grant of Burning Man. As a result, six proposals have been provided funding through the scheme, notably Fractal Cult and Shipwreck constructed in 2013 and Hayam in 2014. Students are heavily encouraged to seek funding for their projects either through the Global Arts Grant or Kickstarter, to see their projects realized. "They try and make it a lot of fun, but it's a lot of work!" said Potter, who also added that DS10's ethos has taught many students, including himself about being independent and self reliant. His project brief, meanwhile, called for a project that could respond to a social agenda, through a set of parameters. As a result, PURSUIT was born. Deriving from a mathematical theory known as "pursuit curvature," a system that relies on inputs and thresholds. Potter used the shape of an arrowhead and formed the idea of six arrowheads pointing towards the center. Using the this algorithmically, an iterative process forces certain points to move in accordance with each other. "With Pursuit Curvature, each point starts at a unique position of a polygon, and moves incrementally towards the nearest adjacent point until they all converge in the centre. The path travelled is directly influenced by the points around it, so the final curves represent the effects all of the points have on one another as a group," he explains. On his Kickstarter page, he goes on to say that his project "celebrates humanity's ongoing quest for Peace, Freedom and Joy - in Life, Love and Art" aiming to "create an interactive and unique sculptural playground for visitors." The design forms three interconnected spaces that offer unique perspectives of their surrounding and interior spatial arrangements. Potter adds that this encourages "playful interaction" and allows visitors to climb up the and around the structure while also providing a "space for personal reflection and communal gathering." If Potter's $25,575 dream is realized, PURSUIT will be burnt to the ground when Burning Man is over, perhaps symbolizing the final end of the "pursuit." Skidmore, Owings & Merrill (SOM) associate Neil Katz describes his approach to crafting facades as involving a “computational design” methodology. In computational design, the architect generates solutions to a particular problem by first defining a set of rules and criteria for the model. Though the many tools Katz uses during this process include intangibles like “a desire to explore as many valid options as possible” and his office’s collaborative environment, in many instances he also performs literal computation—specifically, parametric modeling. Katz will moderate a panel on “Creating Complex Facades with Parametric Control” at next month’s Facades+ Chicago symposium. On day two of the conference, he and SOM colleague Joel Putnam will lead a dialog workshop on “New Techniques in Parametric Design." Parametric modeling can be the means to several ends, explained Katz. First, it can be used to explore a building’s massing, taking into account constraints like program, site, climate, context, and the overarching design concept. When applied to facade panelization, meanwhile, parametric control works with a different set of rules, including the relative flatness of the facade or the desire for regularity or other panel properties. Finally, observed Katz, “analysis and simulation, and visualization of the results, is also part of the parametric process—and can be a parametric process in its own right.” Katz’s affinity for parametric design is in part an outgrowth of his interest in programming. “Even in school, but especially when I started working at SOM, this ability became a natural part of creating models, and performing many of the tasks I was given,” he said. During the 1980s, as a design student enrolled in computer science courses, he was an anomaly. But that may be changing. “For many years, engineers [also had to have] some expertise at programming to do their work,” said Katz. “That’s becoming true for architects as well. I would say that most architecture students are now interested in acquiring and using this skill.” He has observed a similar shift among his fellow architects at SOM. “More and more, my colleagues are building their own models, and my contribution is helping to develop a strategy to make the model as powerful and flexible as possible,” said Katz. Like Katz, his co-panelists are working to solve some of the challenges inherent to parametric design, including the time it takes to perform the various analyses. Tristan d’Estrée Sterk, of Formsolver and ORAMBRA, is “currently developing a tool (Formsolver) which will allow architects to easily optimize a building’s form and material use as little energy as necessary,” said Katz. Matthew Shaxted will also join the conversation. Parallel.Works, the firm he co-founded, gives AEC industry professionals access to the computing power necessary to perform many of the analyses described above. “Parallel.Works does not create new tools, as Formsolver does, but allows people to use existing tools in a more powerful way,” observed Katz. Thornton Tomasetti vice president Hauke Jungjohann is the third member of the panel. 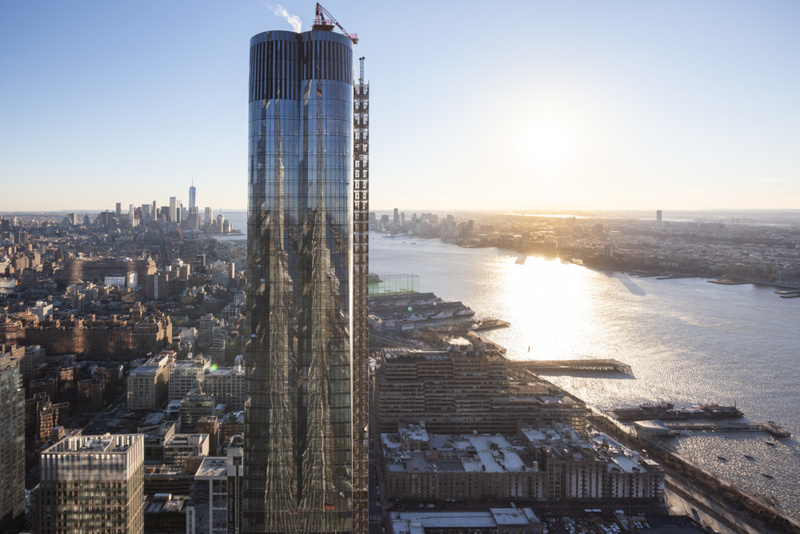 A specialist in parametric modeling, form optimization, and digital information transfer, Jungjohann leads the Facade Engineering practice for the firm’s East U.S. Region. Hear from Katz, d’Estrée Sterk, Shaxted, Jungjohann, and other leaders in the field of building envelope design and fabrication November 5-6 at Facades+ Chicago. Learn more and register today by visiting the Facades+ website.